For this demonstration, we’re using a Harley Davidson Softail, specifically a 2014 Fat Boy Lo. Locate the primary-fluid drain plug, which is right below the primary case. Next, use the socket wrench and T27 torque bit to remove the primary cover. There are five bolts; make sure you set them somewhere safe and so you don’t lose them. Set the primary cover aside. Slide your drain pan in place, then use the 5/8-inch socket and socket wrench to loosen the drain plug. Remove it the rest of the way by hand so it doesn’t fall into the drain pan. Next, replace the gasket on the primary case cover. You should be able to pull the old one right out. The new gasket should drop right into place, then set the cover aside. Clean the drain plug and install the new O-ring. Start it by hand and then snug it up with a socket wrench and 5/8-inch socket. 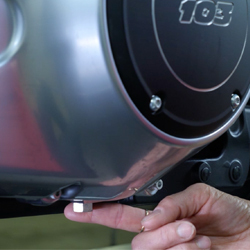 Set the torque wrench to 14-21 foot-pounds of torque and tighten the plug. It helps to use a funnel designed for a primary case. Harley Davidson Softails require one quart of primary fluid. Be sure to check your owner’s manual or the AMSOIL Product Guide for the correct capacity for your bike. Once you’ve filled the primary case with fluid, double check the fluid level visually. The primary fluid should touch the bottom of the clutch plate. Finally, replace the primary cover. 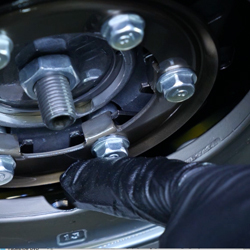 After hand-tightening each bolt, use a torque wrench and T27 torque bit to tighten them to the proper setting. Your torque wrench should be set at 84-108 inch-pounds of torque. Remember to tighten them in a star pattern much like the lug nuts on a car tire.